Wilms' tumor is a cancerous tumor of the kidney that usually occurs in young children. It is named for Max Wilms, a German surgeon (1867–1918) and is also known as a nephroblastoma. When an unborn baby is developing, the kidneys are formed from primitive cells. Over time, these cells become more specialized. The cells mature and organize into the normal kidney structure. Sometimes, clumps of these cells remain in their original, primitive form. If these cells begin to multiply after birth, they may ultimately form a large mass of abnormal cells. This is known as a Wilms' tumor. Wilms' tumor is a type of malignant tumor. This means that it is made up of cells that are significantly immature and abnormal. These cells are also capable of invading nearby structures within the kidney and traveling out of the kidney into other structures. Malignant cells can even travel through the body to invade other organ systems, most commonly the lungs and brain. These features of Wilms' tumor make it a type of cancer that, without treatment, would eventually cause death. However, advances in medicine during the last 20 years have made Wilms' tumor a very treatable form of cancer. appears that the tendency to develop a Wilms' tumor can run in families. In fact, about 1.5% of all children with a Wilms' tumor have family members who have also had a Wilms' tumor. The genetic mechanisms associated with the disease are unusually complex; it is thought as of 2004 that the tumor develops because the defective WT1 gene fails to stop its growth. Other genes that have been linked to Wilms' tumor are located on chromosomes 16q, 7p15, and 17q12. Some patients with Wilms' tumor experience abdominal pain, nausea, vomiting, high blood pressure, or blood in the urine. However, the parents of many children with this type of tumor are the first to notice a firm, rounded mass in their child's abdomen. This discovery is often made while bathing or dressing the child and frequently occurs before any other symptoms appear. Rarely, a Wilms' tumor is diagnosed after there has been bleeding into the tumor, resulting in sudden swelling of the abdomen and a low red blood cell count (anemia). About 4-5% of Wilms' tumor cases involve both kidneys during the initial evaluation. The tumor appears on either side equally. When pathologists look at these tumor cells under the microscope, they see great diversity in the types of cells. Some types of cells are associated with a more favorable outcome in the patient than others. In about 15% of cases, physicians find some degree of cancer spread (metastasis). The most common sites in the body where metastasis occurs are the liver and lungs. Children with Wilms' tumor generally first present to physicians with a swollen abdomen or with an obvious abdominal mass. The physician may also find that the child has fever, bloody urine, or abdominal pain. The physician will order a variety of tests before imaging is performed. These tests mostly involve blood analysis in the form of a white blood cell count, complete blood count, platelet count, and serum calcium evaluation. Liver and kidney function testing will also be performed as well as a urinalysis. Initial diagnosis of Wilms' tumor is made by looking at the tumor using various imaging techniques. Ultrasound and computed tomography scans (CT scans) are helpful in diagnosing Wilms' tumor. Intravenous pyelography, where a dye injected into a vein helps show the structures of the kidney, can also be used in diagnosing this type of tumor. Final diagnosis, however, depends on obtaining a tissue sample from the mass (biopsy), and examining it under a microscope in order to verify that it has the characteristics of a Wilms' tumor. This biopsy is usually done during surgery to remove or decrease the size of the tumor. Other studies (chest x rays, CT scan of the lungs, bone marrow biopsy) may also be done in order to see if the tumor has spread to other locations. In the United States, treatment for Wilms' tumor almost always begins with surgery to remove or decrease the size of the kidney tumor. Except in patients who have tumors in both kidneys, this surgery usually will require complete removal of the affected kidney. During surgery, the surrounding lymph nodes, the area around the kidneys, and the entire abdomen will also be examined. While the tumor can spread to these surrounding areas, it is less likely to do so compared to other types of cancer. In cases where the tumor affects both kidneys, surgeons will try to preserve the kidney with the smaller tumor by removing only a portion of the kidney, if possible. Additional biopsies of these areas may be done to see if the cancer has spread. The next treatment steps depend on whether/where the cancer has spread. Samples of the tumor are also examined under a microscope to determine particular characteristics of the cells making up the tumor. Information about the tumor cell type and the spread of the tumor is used to decide the best kind of treatment for a particular patient. Treatment is usually a combination of surgery, medications used to kill cancer cells (chemotherapy), and x rays or other high-energy rays used to kill cancer cells (radiation therapy). These therapies are called adjuvant therapies, and this type of combination therapy has been shown to substantially improve outcome in patients with Wilms' tumor. It has long been known that Wilms' tumors respond to radiation therapy. Likewise, some types of chemotherapy have been found to be effective in treating Wilms' tumor. These effective drugs include dactinomycin, doxorubicin, vincristine, and cyclophosphamide. In rare cases, bone marrow transplantation may be used. The National Wilms' Tumor Study Group (NWTSG) has developed a staging system to describe Wilms' tumors. All of the stages assume that surgical removal of the tumor has occurred. Stage I involves "favorable" Wilms' tumor cells and is usually treated successfully with combination chemotherapy involving dactinomycin and vincristine and without abdominal radiation therapy. Stage II tumors involving a favorable histology (cell characteristics) are usually treated with the same therapy as Stage I. Stage III tumors with favorable histology are usually treated with a combination chemotherapy with doxorubicin, dactinomycin, and vincristine along with radiation therapy to the abdomen. Stage IV disease with a favorable histology is generally treated with combination chemotherapy with dactinomycin, doxorubicin, and vincristine. These patients usually receive abdominal radiation therapy and lung radiation therapy if the tumor has spread to the lungs. As of 2004, there are significant differences between the treatment protocols of the NWTSG and its European counterpart, the Société Internationale d'Oncologie Pédiatrique (SIOP). Whereas American practice favors surgery followed by chemotherapy, European oncologists use preoperative chemotherapy and stage the tumor at the time of surgery rather than at the point of initial imaging studies. Biopsy — A procedure in which a small sample of tissue is removed, prepared, and examined with a microscope to determine the characteristics of the tissue's cells. Blastemal — An immature material from which cells and tissues develop. Cancer — A process where abnormal cells within the body begin to grow out of control, acquire the ability to invade nearby structures, and travel through the bloodstream in order to invade distant structures. Malignant — Refers to cancer or cancer cells. Sarcoma — A type of cancer that originates from connective tissue such as bone or muscle. Stromal — A type of tissue that is associated with the support of an organ. Tubule — Tissues and cells associated with the structures that connect the renal pelvis to the glomeruli. The prognosis for patients with Wilms' tumor is quite good, compared to the prognosis for most types of cancer. One German study reported the overall five-year survival rate to be 89.5%. The patients who have the best prognosis are usually those who have a small-sized tumor, a favorable cell type, are young (especially under two years old), and have an early stage of cancer that has not spread. Modern treatments have been especially effective in the treatment of this cancer. Patients with the favorable type of cell have a long-term survival rate of 93%, whereas those with anaplasia have a long-term survival rate of 43% and those with the sarcoma form have a survival rate of 36%. There are no known ways to prevent a Wilms' tumor, although it is important that children with birth defects associated with Wilms' tumor be carefully monitored. Beers, Mark H., MD, and Robert Berkow, MD., editors. "Wilms' Tumor (Nephroblastoma)." In The Merck Manual of Diagnosis and Therapy. Whitehouse Station, NJ: Merck Research Laboratories, 2004. Black, Timothy L. "Wilms' Tumor." In Dambro: Griffith's 5-Minute Clinical Consult. Philadelphia: J.B. Lippincott, 1999. DeVita, Vincent J., et al., editors. "Wilms' Tumor." In Cancer: Principles and Practice of Oncology. Philadelphia: J. B. Lippincott Company, 2001. Boglino, C., A. Inserra, S. Madafferi, et al. "A Single-Institution Wilms' Tumor and Localized Neuroblastoma Series." Acta Paediatrica Supplementum 93 (May 2004): 74-77. Coppes, Max J., and Kathy Pritchard-Jones. "Principles of Wilms' Tumor Biology." Urologic Clinics of North America 27 (August 2000). Emerson, R. E., T. M. Ulbright, S. Zhang, et al. "Nephroblastoma Arising in a Germ Cell Tumor of Testicular Origin." American Journal of Surgical Pathology 28 (May 2004): 687-692. Glick, R. D., M. J. Hicks, J. G. Nuchtern, et al. "Renal Tumors in Infants Less Than 6 Months of Age." Journal of Pediatric Surgery 39 (April 2004): 522-525. Neville, Holly L., and Michael L. Ritchey. "Wilms' Tumor." Urologic Clinics of North America 27 (August 2000). Weirich, A., R. Ludwig, N. Graf, et al. "Survival in Nephroblastoma Treated According to the Trial and Study SIOP-9/GPOH with Respect to Relapse and Morbidity." Annals of Oncology 15 (May 2004): 808-820. American Cancer Society. 1515 Clifton Rd. NE, Atlanta, GA 30329. (800) 227-2345. http://www.cancer.org. March of Dimes Birth Defects Foundation, National Office. 1275 Mamaroneck Ave., White Plains, NY 10605. http://www.modimes.org. National Cancer Institute (National Institutes of Health). 9000 Rockville Pike, Bethesda, MD 20892. (800) 422-6237. 〈http://www.nci.nih.gov\〉. National Wilms Tumor Study Group (NWTSG). Fred Hutchinson Cancer Research Center, 1100 Fairview Avenue North, P. O. Box 19024, Seattle, WA 98109-1024. (800) 553-4878. Fax: (206) 667-6623. http://www.nwtsg.org. Online Mendelian Inheritance in Man (OMIM). #194070. "Wilms Tumor 1; WT1." http://www3.ncbi.nlm.nih.gov/entrez/dispomim.cgi?id=194070. A malignant tumor of the kidney that is associated with certain genetic abnormalities and chiefly affects young children. Also called nephroblastoma. a malignant neoplasm of the kidney occurring in young children before the fifth year in 75% of the cases. It is slightly more common among females than males and among African-American children than Caucasian children. The most frequent early signs are hypertension, a palpable mass, pain, and hematuria. Diagnosis can be established by an excretory urogram with tomography. The tumor, an embryonal adenomyosarcoma, is well encapsulated in the early stage, but it may extend into lymph nodes, the renal vein, or the vena cava and metastasize to the lungs or other sites. Removal of resectable tumors by transperitoneal nephrectomy is recommended. Radiotherapy is used before or after surgery or palliatively in inoperable cases. Chemotherapy combined with surgery and irradiation is proving highly effective. Also called adenomyosarcoma, nephroblastoma. See also kidney cancer. Nephroblastoma Oncology An embryonal renal tumor that arises in aberrant mesenchymal renal stem cell lines, coupled with loss of functioning tumor suppressor genes; WT comprises 92% of 1º childhood renal CAs–frequency: 1:10,000–the rest are sarcomas Clinical WT presents as a mass, often with HTN 60%, hematuria 24%, nephritis–Wilms' nephritis, serosal effusions–ascites, pleural effusions; 5% are bilateral; anaplasia connotes a poor prognosis. See WAGR syndrome. 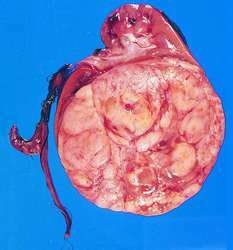 a rapidly developing malignant mixed tumor of the kidneys, made up of embryonal elements, and occurring chiefly in young pigs and chickens; called also embryonal nephroma, nephroblastoma. Wilms' tumor is the second most common intra-abdominal malignancy of childhood and overall fifth most common pediatric malignancy. The Whitehead group would also like to use the mouse as a model for studying how these faulty suppressor genes lead to Wilms' tumor. A review of the Wilms' Tumor (Nephroblastoma) products under development by companies and universities/research institutes based on information derived from company and industry-specific sources. All tumors were identified and categorized into blastemal, epithelial, stromal, mixed type, and anaplasia by pathologist after excision, according to National Wilms' Tumor Study (NWTS). Therapy and outcome in 51children with mesoblastic nephroma: a report of the National Wilms' Tumor Studies. Risk factors for Wilms' tumor: report from the National Wilms' Tumor Study. Earlier this year, he and colleagues described studies of the gene responsible for Wilms' tumor, an inherited kidney cancer in children. Global Markets Direct's, 'Wilms' Tumor (Nephroblastoma) - Pipeline Review, H1 2012', provides an overview of the Wilms' Tumor (Nephroblastoma) therapeutic pipeline. Primary hepatic neoplasms are the third most common abdominal malignancy in childhood, after Wilms' tumor and neuroblastoma. Exclusion of certain renal neoplasms from the category of Wilms' tumor. Ligand activated Ahr signaling leads to disruption of nephrogenesis and altered Wilms' tumor suppressor gene splicing.